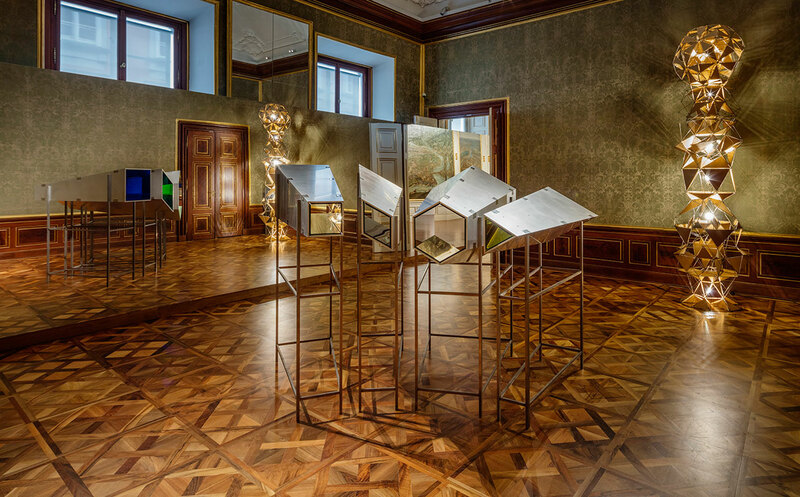 In cooperation with the Belvedere in Vienna, BAROQUE BAROQUE features a selection of artworks by Danish-Icelandic artist Olafur Eliasson from the private collections of Thyssen Bornemisza Art Contemporary (TBA21) and Juan and Patricia Vergez, as well as newly commissioned works, ingeniously displayed at one of the most magnificent baroque edifices in the city, the Belvedere’s Winter Palace. 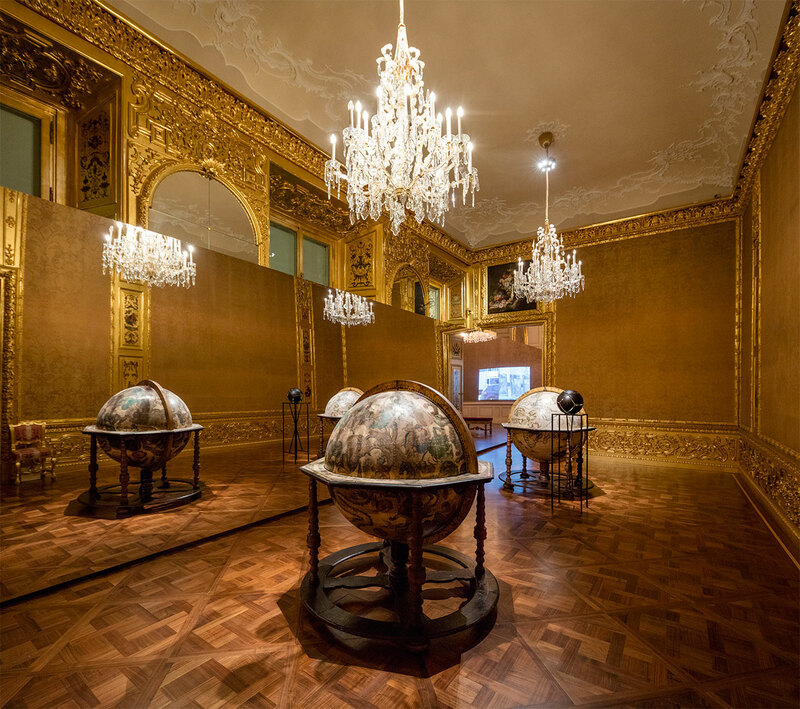 The palace —a former residence of Prince Eugene of Savoy, himself an important patron of the arts and sciences in baroque Vienna— is fertile ground for Eliasson, who has repurposed its spaces so that visitors can experience them in new and unexpected ways. 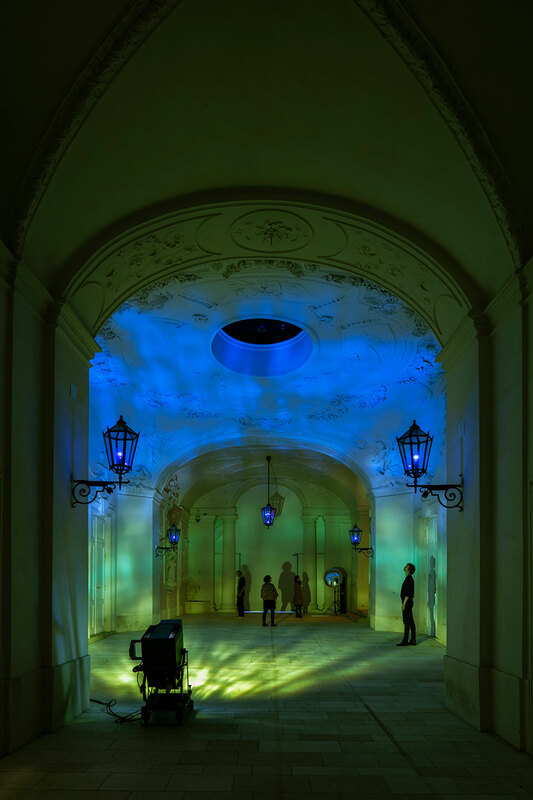 Through the creative use of light, colour, reflections and projections, the artworks emulate baroque’s attack on the senses and at the same time manage to superimpose baroque on itself. 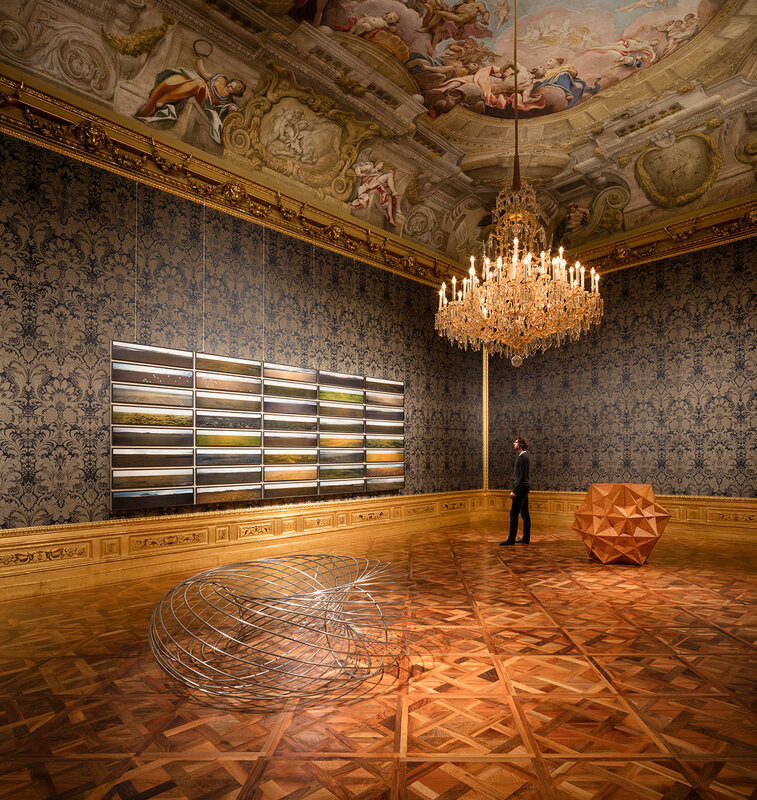 Although at first glance Eliasson’s work and the Baroque may seem, both aesthetically and technically, worlds apart, conceptually there is common ground which makes the cohabitation of the two all the more interesting beyond the thrill of mere juxtaposition. The Baroque, coaxed by both the Catholic Church and the aristocracy, evolved out a desire to impress by evoking emotional states and as such it appeals exclusively to the senses; to achieve this it uses dramatic effects like exuberance, grandeur, movement and tension in order to create an enhanced reality through overstimulation. 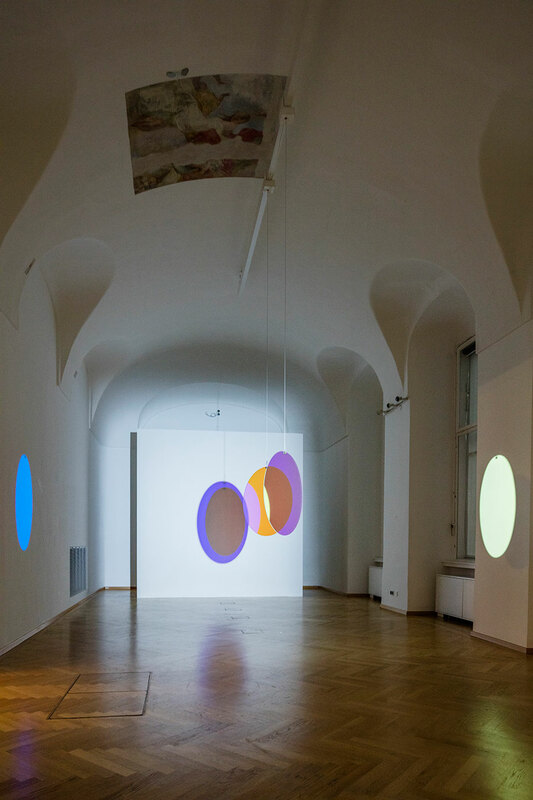 Although Eliasson’s point of departure and modus operandi may be vastly different, his work also aims at stretching reality by manipulating the viewer’s perception. 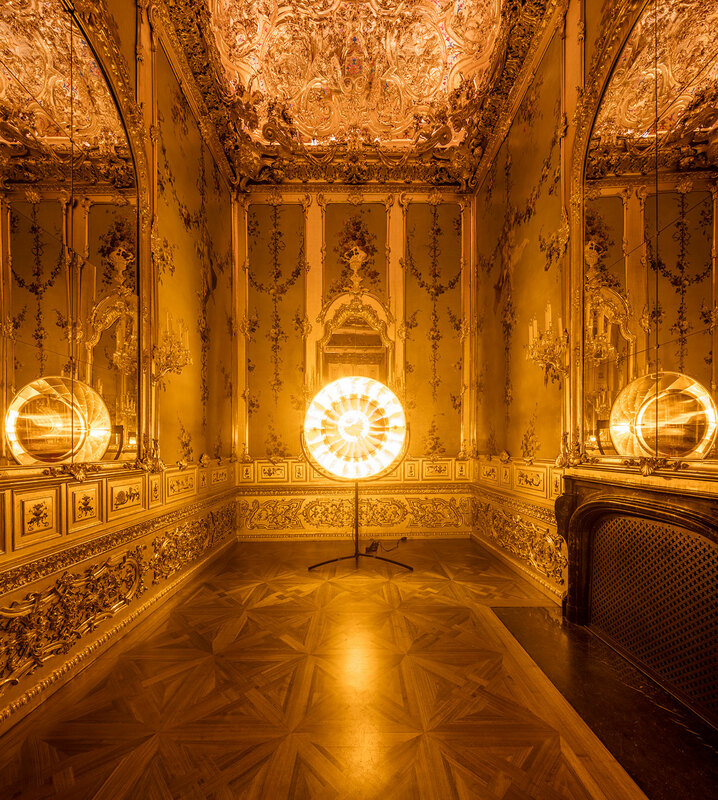 In “Die organische und kristalline Beschreibung” (“The Organic and Crystalline Description”, 1996), a projector coupled with a wave-effect machine washes through a convex mirror in the entrance vestibule of the Palace with simmering blues and yellows. The resulting motion of coloured light dematerialises the space transforming it into an underwater dreamscape. 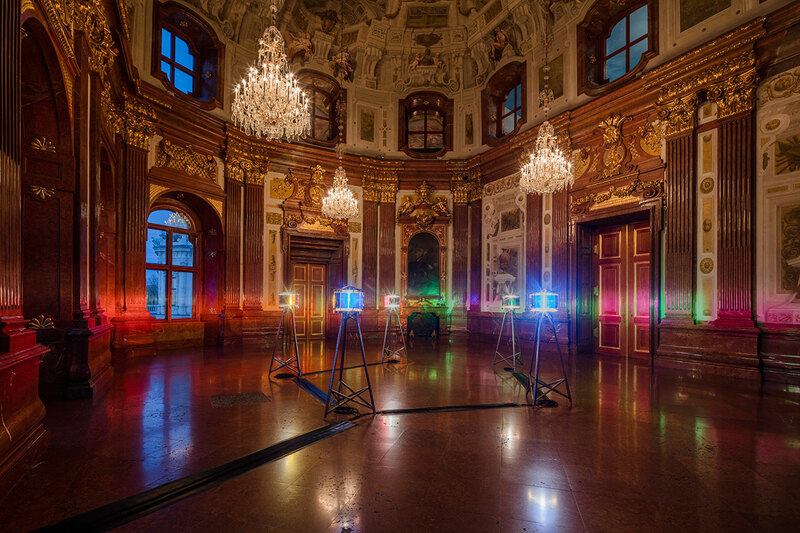 Colour is also a key element in “Five orientation lights” (1999), whereby the Marble Hall of the Upper Belvedere is divided into five sections through being illuminated in different colours, and in “Yellow Corridor” (1997), where the Palace’s grand staircase is monochromatically saturated with yellow light. Deprived from experiencing any other hues, the visitor develops hyper detailed vision, giving the statues, reliefs and other flourishes he/she encounters an added vibrancy. Exiting the space, as Eliasson explains, you realise that “colour is dependent on the existence of other colours in order to be understandable”. 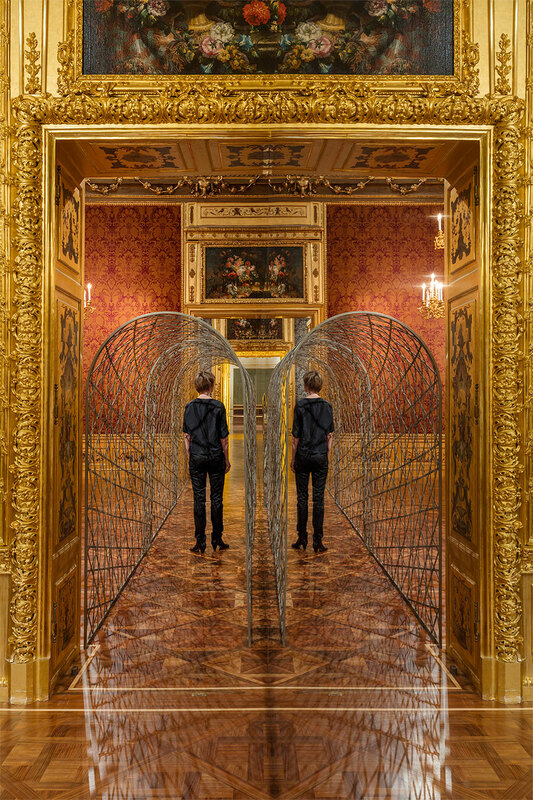 In “Wishes versus wonders” (2015), a site-specific intervention, a continuous mirror partition runs along the middle of the rooms splitting them in two but simultaneously conjuring back their original volume by reflecting the visible half. 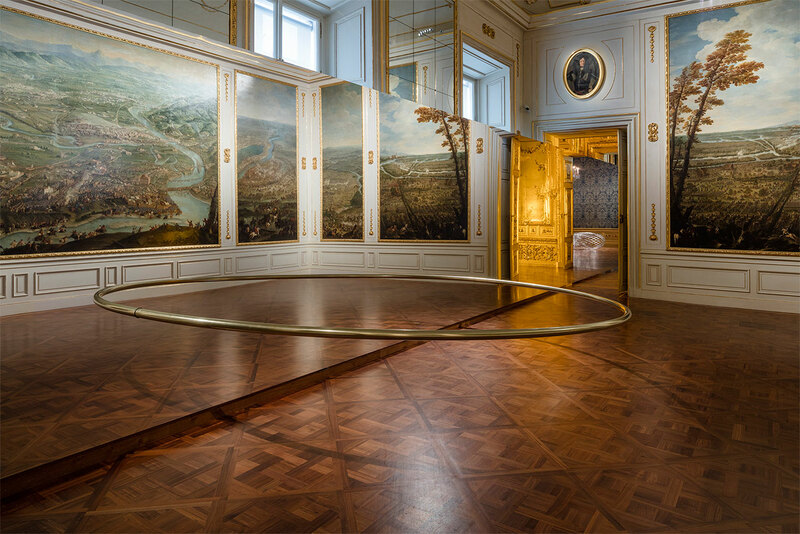 The perception of dizzying completeness is reinforced by a semicircular five-meter brass ring fixed on the mirror in the middle of the rooms, which, though reflection, gives the illusion of a circular form hovering in the middle of the space. “Kaleidoscope” (2001), a seven metre long hexagonal optical device hung from the ceiling of the Sala Terrena, also uses reflections but in this case to deconstruct rather than to recreate the space. “What we see through its mechanism”, Eliasson explains, “is to a large extent negotiable, relative and open for engagement”. 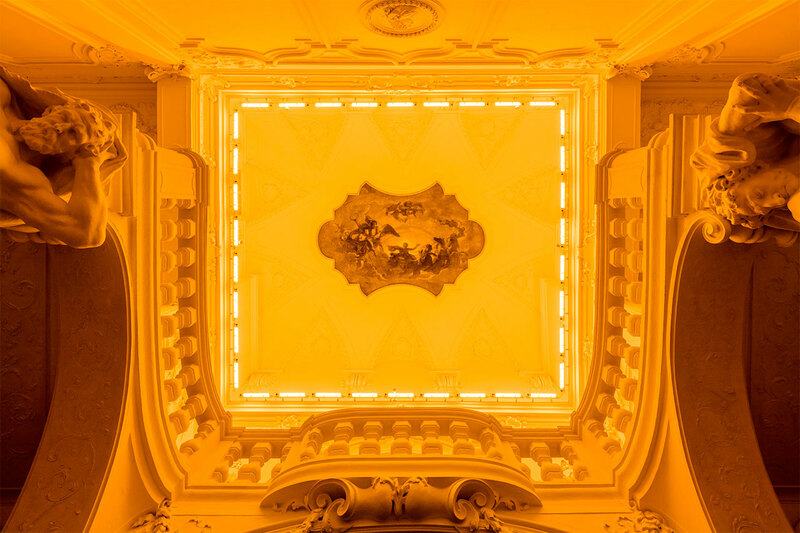 In other optical installations like “New Berlin Sphere” (2009) and “Your welcome reflected” (2003), refracted coloured light adds a new layer of shifting patterns on top of the baroque iconography, instigating a visual dialogue of past and present. 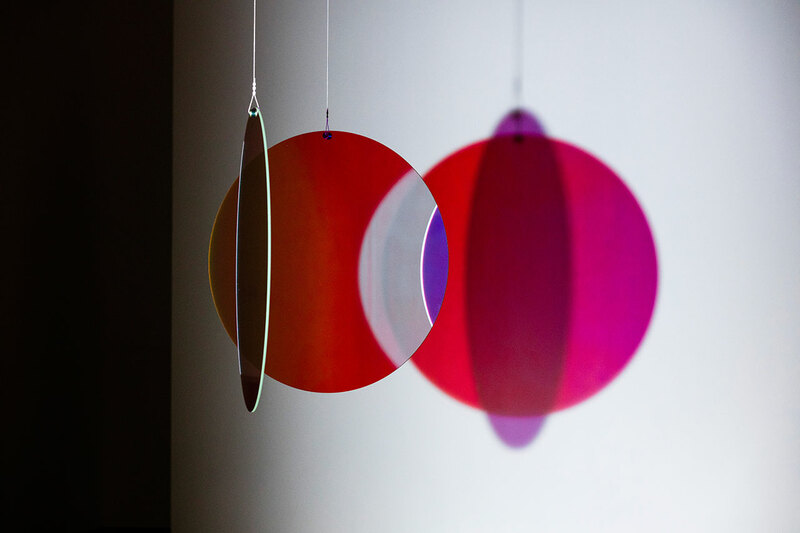 Eliasson’s wide range of techniques, in full display at this exhibition, require the visitors’ active participation in re-calibrating each space in relation to both the artist’s intervention and their position within it, ultimately making them question the way perception works.